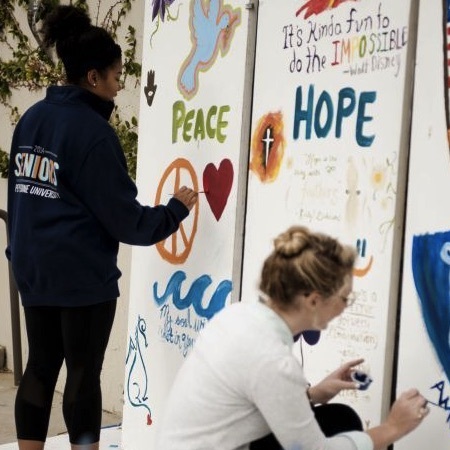 The Pepperdine Volunteer Center and Intercultural Affairs will present the Week of Peace, Hope, and Justice during the week of January 18 to 22, when the community will engage the topics of social justice and equity. Students are invited to learn and serve through discussions, performances, volunteer opportunities, and worship that promote community, equity, and social change, all leading toward the reconciliation of God's people and creation. The week will begin on Martin Luther King, Jr. Day, also the National Day of Service, honoring Dr. King's legacy of hope and reconciliation by working with Voices of Refugees, a Project Serve partner. On Tuesday, January 19, the Day Devoted to Peace will begin with the Peace, Hope, and Justice Fair that will host local NGOs and organizations around Los Angeles that are involved with issues of social justice and world peace. This opportunity aims to educate the student population on initiatives within Los Angeles and ways they can be involved. A Healthy Happy Hour from 2 to 5 PM at lower Mullin Town Square will provide healthy treats, as well as the opportunity to enjoy peaceful yoga and prayers. In the evening, Bishop Darrell L. Bush will lead MLK Chapel worship at 6 PM at Stauffer Chapel. Wednesday's activities honoring the Day Devoted to Hope include a morning chapel at 10 AM led by Bishop Darrell L. Bush at Firestone Fieldhouse. A trip to the Museum of Tolerance at 1 PM will include a tour of the museum, a discussion with a holocaust survivor, as well as time for a Q&A session. On Thursday, January 21, the Day Devoted to Justice will begin with a discussion panel at 5:30 PM in Elkins Auditorium, entitled "Bearing the Cross," led by School of Law faculty Roslyn Satchel and Jeff Baker, as well as Oscar Mondragon of the Malibu Labor Exchange. The panelists will discuss what it looks like to incorporate justice into one's career and lifestyle. The day's activities will conclude with "The Well," where guest speaker Alain Datcher (MPP '15) will explore the themes of the day at 7:30 PM at the Amphitheater. A Celebration Chapel on Friday, January 22, will begin at 10 AM at the Amphitheater. Later in the evening, a Coffeehouse at the Sandbar will feature the theme of Peace, Hope, and Justice through song, poetry, and spoken word performed by students. Throughout the week, students are invited to participate in ongoing programs, such as the Steps Challenge, which pays tribute to Dr. King's 54-mile walk from Selma to Birmingham. Teams of two are encouraged to sign up in order to walk 54 miles during the week to honor this historical event. Participants are also encourage to use the #PeaceHopeJustice hashtag through social media to share thoughts, photos, and prayers during the week. A photo contest held via Instagram will award a winning photo that best depicts peace, hope, and justice. A winner will be determined on Friday, January 22. Students are also encouraged to create their own art piece dedicated to the message of the week with an art exhibit that will be on display in the Payson Library display case. The exhibit aims to highlight the recent social injustices by demonstrating the theme “Where is the Love?” through various mediums. Throughout the week, the display case at the Sandbar will demonstrate themes of peace, hope, and justice at one side and visuals depicting Armenian heritage on the other. Elsewhere on campus, a series of black-and-white photos of students, faculty, and staff will be on display, urging the campus community to ponder the question, "How do we demonstrate peace, hope, or justice in our everyday lives?" At the Weisman Museum, a self-guided tour that can be taken during the duration of the exhibit (January 16 to April 3) will lead participants on an exploration of Andy Warhol's greatest works, which were typically representative of current events of the '60s and '70s and often contained subtle tones of discontent with the American life. Some notable works to see include "Birmingham Race Riot" and the series of lithographs featuring Muhammad Ali. For more information, visit the Pepperdine Volunteer Center website.